This building at the corner of Gawler Place and North Terrace in Adelaide is one of my favourites. Still in use, the building houses office suites mostly of the medical profession. It is a pity that the external appearance is compromised by the installation of window type air conditioning units. Built it 1913-1914 by the South Australian Company, the Gawler Chambers is a five-storey office building, which is symmetrical in design. It has a red brick facade, with cement dressings, and the main entrance is finished in Murray Bridge granite and freestone. The building is eclectic in style, containing classical and Tudor Gothic features. There is a castellated parapet over a central projecting section that forms part of the entry porch at ground level. The interior contains cedar work that was transferred from the South Australian Company's former building to their offices on the western end of the first floor of Gawler Chambers. There are internal piers and beams of reinforced concrete. The foyer of the building has been altered, and there are some other minor alterations to the interior. English and Soward were the architects of the new building, Gawler Chambers, which was built in two stages. The first stage, the eastern side, was completed in November 1913 and the second stage, the western side, in March 1914. Originally Gawler Chambers was four storeys with a Val de Travers asphalt covered flat roof. In 1935 another floor was added to the top of the building. The balconies on the 3rd and 4th floors were removed in 1965. Design engineers awarded the contract was the South Australian Reinforced Concrete Co. with John Monash as chief engineer. Gawler Chambers is heritage-listed due to the its association with the South Australian Company which played a central role in the foundation of South Australia, and established many industries and enterprises, including whaling, banking and pastoral enterprises. This building is one of few surviving tangible reminders of the Company, which was actively associated with the site for over one hundred years, in an earlier building from 1842 and in Gawler Chambers until 1945. 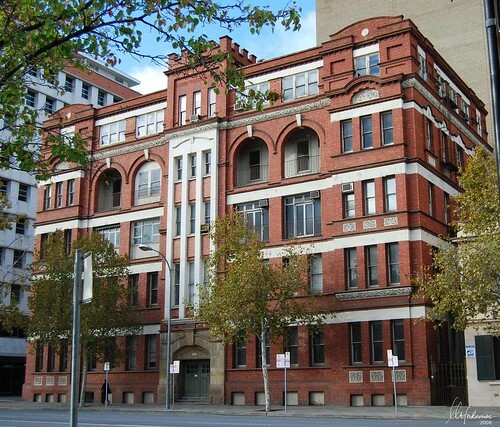 The Chambers, through its association with the South Australian Company, has an important link to the early development of South Australia. Hi! I was wondering whether you know with certainty that the building is in use or whether you just read the sign on the door. I have always loved the Gawler Chambers and it is my dream to turn it into apartments...now all I need id the funds to do it! Hi! That is one of my favourite buildings in Adelaide. My friend and I's dream is to fix it up as apartments one day...now all we need is the money. I was wondering whether it is currently in use or you just saw the sign on the front of the building?